Notice & Comment had a vision to enhance American governance by creating a platform for the interaction of the general public with all levels of government and legislature. In January 2013 this dream came true! 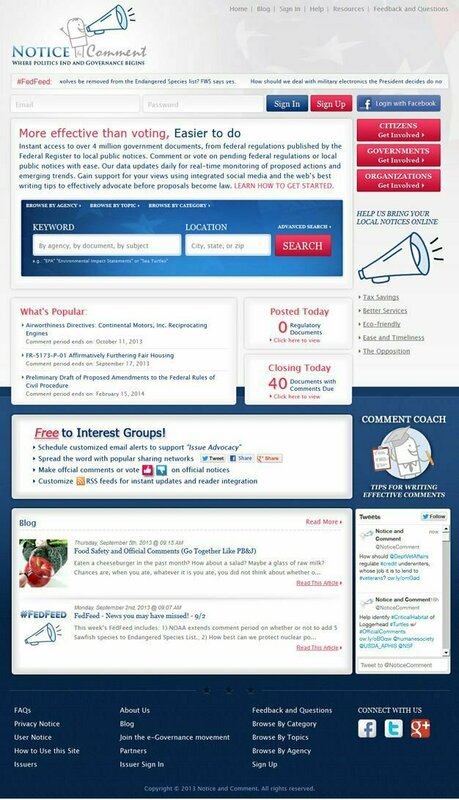 Now citizens can become effective advocates for themselves and their communities by generating discussions on notices found on noticeandcomment.com. Too often the local tax payers money is wasted on the ineffective posting of federal public notices in local newspaper’s that no longer have the kind of readership of days gone by. This is not only an economic burden, but it hinders the civic rights of those who are denied the opportunity to participate in stating their opinions of proposed government actions. Notice & Comment posts only official notices that the local governments retain control over, to ensure continued participation on this site. As a non-partisan communications utility, we take no sides and thus there’s no political risk for local governments to join. In return, the nation can benefit from our unique database of public sentiment, trends and tipping points, which is the heart of good civic analysis and decision-making. Notice & Comment is America’s first electronic portal for file management, library archives, and a filing system that organizes official public notices and press releases as soon as they are issued. With effective social networking and assistance for comment writing by offering various helps, Notice & Comment, help the various levels of government – federal, state, county and local – to come together under one structured site. Pulse worked with HTML to build a site that the public can conveniently use, from any location, to shape the proposed actions that affect them. Once signed in it is easy to navigate through the notices and add comments or longer expressions via blog. Keeping in mind the participation of both government and public entities, there are clear tabs to direct each group’s involvement, saving valuable time in organization management. With live feeds and keyword search, this simple design is effective in its abilities to fulfil Notice & Comment purpose and vision. The software was written using .Net platform, AJAX, JSON and other advanced web techniques to achieve performance and usability goals.